A Malaysia Airlines plane en route from Amsterdam to Kuala Lumpur has crashed in eastern Ukraine. There were 283 passengers and 15 crew members on board the Boeing-777 aircraft. The bodies and ashes of first 20 Malaysian victims of MH17 crash arrived in Kuala Lumpur on a charted Malaysian Airlines jet from Amsterdam, AP reports. The remains of the victims were met with a solemn ceremony at the airport by lines of honor guards. The Malaysian government has proclaimed August 22 a national day of mourning, urging people to wear black and observe a minute of silence and prayer. "We have sufficient information to compile a preliminary report," said Wim van der Weegen, spokesman for the Dutch Safety Board (OVV). "We hope that it will be ready in a few weeks," he told AFP, adding that the Dutch investigators had returned to the Netherlands without visiting the crash site. "In order to analyze the information...it's not essential to remain in Ukraine," Van der Weegen told AFP, adding that the team will now be based in The Hague. Sixty-five out of 298 MH17 Malaysia Airlines crash victims have been identified in the Netherlands, the country’s Ministry of Security and Justice stated. Thirty-nine of the victims were citizens of the Netherlands, while 26 were foreigners. “Due to demands from the countries’ embassies, the information on the citizenship will not be revealed from now on,” the Ministry stated, adding that the families of the victims have already been notified. The Netherlands is halting the mission to recover victims and debris of the MH17 Malaysia Airlines crash because of fighting between Ukrainian forces and militias in eastern Ukraine, the Dutch prime minister said on Wednesday. "The security situation in eastern Ukraine and the MH17 crash site has worsened by the day," PM Mark Rutte said. "That is making it impossible for experts to do their work." He said it made no sense to continue the operation under the current conditions. The team of 70 Australian, Dutch and Malaysian experts is still trying to find the missing victims and their belongings. An international crash investigation has yet to conduct on-site inquiries. Earlier, the Dutch Safety Board said their preliminary report into the crash is delayed for weeks. US military personal arrived in Kiev to form a survey and assessment team, in order to consult the group of international experts conducting the recovery of the downed Malaysian plane in eastern Ukraine, Pentagon Press Secretary Rear Admiral John Kirby told reporters. US European Command spokesman US Navy Captain Gregory Hicks added that the team would have an advisory role, assisting the US Embassy in Kiev in determining possible US support to the Netherlands, Malaysia, and Australia in the MH17 investigation and recovery. A new area of the MH17 crash site has been identified by international experts investigating the downing of the Malaysian plane. The experts started searching the newly discovered area on Monday and have already collected several objects belonging to the victims, according to the latest OSCE report. The location is between the villages of Petropavlovskoe and Rassypnoe in eastern Ukraine. The international team of police officers and experts were able to complete search and recovery work at the site where flight MH17 crashed two weeks ago, said Pieter-Jaap Aalbersberg, the head of the mission. 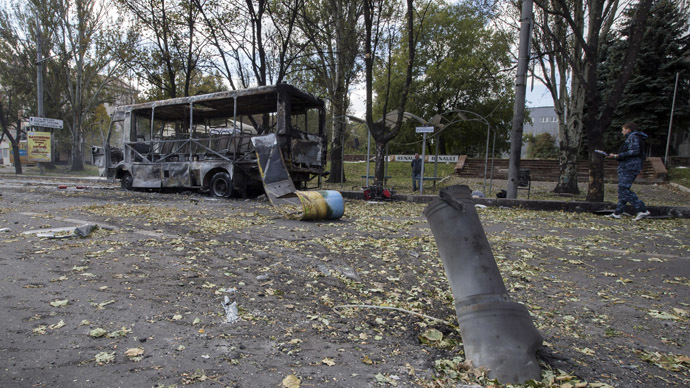 “The experts searched a large area near the village of Rossupnoye. The work had to be stopped temporarily due to negotiations being conducted by the OSCE. A smaller group of experts was able to work undisturbed for the rest of the afternoon. The search in this area is now completed,” Aalbersberg said. He added that a small number of personal belongings were found and taken to the base in Soledar. 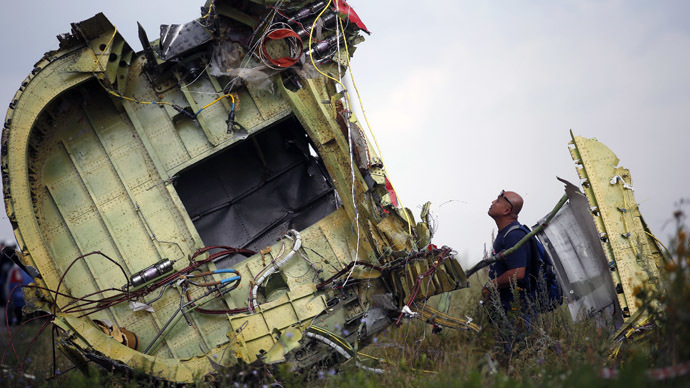 International forensic experts have resumed work at the site of the crashed Malaysia Airlines plane in the Donetsk Region, OSCE spokesman, Shiv Sharma, told ITAR-TASS. The work in the area has been resumed. It were disrupted so that the experts could evaluate the safety situation on the crash site, he added. The head of a team of international investigators says more personal belongings of victims of the Malaysia Airlines Flight 17 disaster in eastern Ukraine have been found, but no human remains, AP reports.